Our Secret enables you to hide and encrypt files within other files (called carrier files) such as pictures or sound files. This allows you to encrypt sensitive information, while at the same time hiding it in a file that will not look suspicious, so nobody even knows that there is any encrypted information. The program gives you options to hide a text message, or any files that you want. You can specify a password to extract the hidden files. Our Secret enables you to hide and encrypt files within other files (called carrier files) such as pictures or sound files. This allows you to encrypt sensitive information, while at the same time hiding it in a file that will not look suspicious, so nobody even knows that there is any encrypted information. 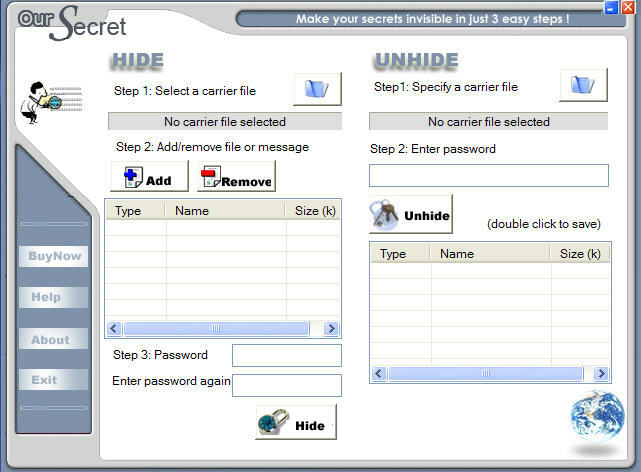 File Secret is a computer security utility for Hiding, Protecting and locking. All-in-One SECRETMAKER is your Swiss Army Knife for the Internet. Have you seen the Underground Cash Secret website? Learn The Amazing Secret To Paying NOTHING For Power. Qweas is providing links to Our Secret 2.5.0.3 as a courtesy, and makes no representations regarding Our Secret or any other applications or any information related thereto. Any questions, complaints or claims regarding this application Our Secret 2.5.0.3 must be directed to the appropriate software vendor. You may click the publisher link of Our Secret on the top of this page to get more details about the vendor.